Welcome to the Creation Station Blog Hop for July! 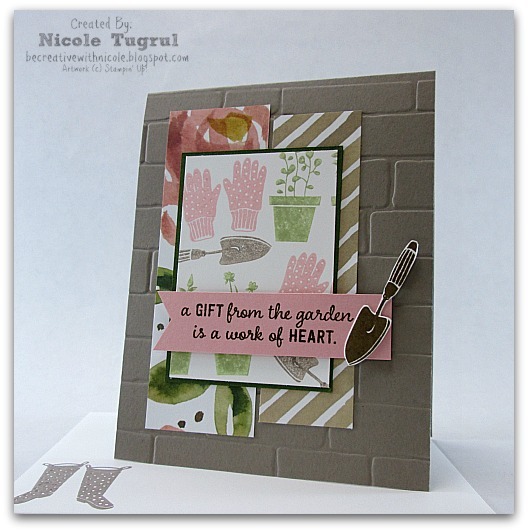 This month we are sharing cards and projects with the theme GIFTS FROM THE GARDEN. We have tons of ideas to share, so be sure to hop all the way around to see everyone’s cards and projects! Since we are going with a garden theme today, I used the new bundle JAR OF LOVE to create a fun little seed packet holder and matching gift card. I just love this bundle!!! My brain hurts just contemplating how many different ways to use these cool Mason jars! This little seed packet holder and card are a perfect little something to give as a thank you. To make the seed packet holder sturdy I used kraft cardstock. I love this kraft color with the blues and coral….so pretty! Have you guessed how I made the little pocket?? If you said ENVELOPE PUNCH BOARD you are right! It was easy peasy. Just cut the kraft cardstock 6″x 6″ and start at the 3″ line for scoring and punching. Instead of scoring the last flap, leave it alone and cut it down instead. I just left about a half inch of cardstock at the back to support the seed packets. The jar of flowers is pretty simple as well. All the flowers and leaves were die cut with the coordinating EVERYDAY JARS FRAMELITS. The flowers are Calypso Coral, the first layer is stamped off to give the variation in color. The leaves are in Pear Pizzaz which looks beautiful with the coral. I added in Dapper Denim as an accent color to tie in the color from the seed packet….worked out pretty well!! The gift card is done with all the same colors and made to fit the medium sized jar. I cut the card base 7 1/2″ x 2 1/2″ with the focus all on the jar of flowers. It compliments the seed packet nicely and gives you a way to add a little note to the recipient. I hope I provided you will a little inspiration for JAR OF LOVE. Now let’s check out what the rest of the very talented Design Team has made. The next stop is Mikaela Titheridge and if you just started here, be sure to go back and see Kimberly Van Diepen. As you are hopping through, leave comments to let us know what you think….we love to get your feedback! Thanks so much for joining us this month for GIFTS FROM THE GARDEN. Welcome to another Create with Connie and Mary Saturday Blog Hop! This week our theme is TOGETHER FOREVER so we are sharing WEDDING AND ANNIVERSARY cards. Since I’ve been working with BIRTHDAY BLOOMS I went ahead and did a beautiful water color anniversary card. I heat embossed the small flowers in white all over then did an abstract water color over the whole card. I didn’t keep within any of the lines, I wanted the messy water color look to fill the entire card front. I went back after the first layer of color was dry and added darker shading. All of it was done with my aqua painter and my ink pads. For the sentiment, I looked to the hostess set HAPPY BIRTHDAY, EVERYONE. This set is meant for birthdays, but I love the sentiment “to my darling” and thought is was perfect for this card. I heat embossed the words in white on Blushing Bride cardstock to add over top of the water color. For a little bling, silver thread and sequins were added. Now let’s get to the supply list so you can re-create your own BIRTHDAY BLOOMS water color card. Welcome to another Create with Connie and Mary Saturday Blog Hop! This week we are all about the BLING! Honestly, I wasn’t sure where to start!! So, I sat down and do what I normally do when ideas are slim, I look through my designer paper and what I have on my desk. This time around, the COTTAGE GREETINGS CARD KIT stood out to me since it has sequins and silver in it. This is an idea that struck me as I looked at the paper. Do heat embossing directly on the paper with a big, bold sentiment. And what could be better for big and bold than BOTANICALS FOR YOU. Since the card has silver all over it, the sentiment needed to stand out. So, in comes black embossing powder and a ginormous greeting. I also thought doing a juxtaposition would be cool so that’s how the black paper with silver embossing came about. And of course since we are all about bling, I had to add lots of SEQUINS! And with this card being from the COTTAGE GREETINGS CARD KIT, I needed the envelope that was included as this is a square card. The silver liner was the final addition of bling. And here’s a little tip~~ cut down the liner since you can’t see the bottom! I cut off three inches from the bottom and tucked it away for another day! Now for the good stuff…the supply list so you can make your own card! The February Mini Session from Create with Connie and Mary is live! Have you subscribed yet?? 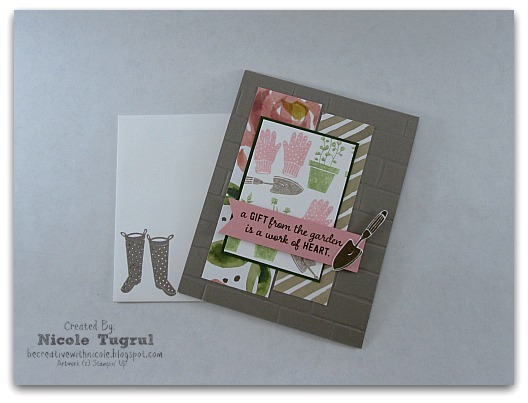 We have five AWESOME tutorials for you featuring sets from the Occasions Catalog. If you haven’t subscribed yet, be sure to check out the details at Create with Connie and Mary. Did you purchase the 2-month VALENTINE BONUS SPECIAL in January?? If you did, the password was included in your Welcome Letter. I don’t know about you, but I love little treats and decorations for Halloween. I am already planning out some party ideas that I thought would be fun to share! I’ve been busy as you can see! It all started with the thought of doing a banner and I just kept going and going! Each piece of the banner has different stamps and die cuts from the Howl-o-ween Treat bundle and was way more fun to create than I anticipated! The panels are each 4″ x 6″ with the banner end hand cut. I am actually working on a tutorial to release next week with the instructions for the banner and the treats so you can make your own! UPDATE: YOU CAN FIND THE TUTORIAL HERE! Now let’s check out all the treats. I wanted a variety so there would be something for everyone’s taste. I am well known for my chocolate chip cookies, so a cookie envelope was the first idea to come to mind. They are 3 1/2″ x 3 1/2″ and are just the right size for a cookie! The envelope punch board made this a quick and easy project. The hardest part was choosing which patterns of the Happy Haunting Designer Series Paper to use! Next up, pixie stix! Theses are a staple at Halloween in our house, so a quick and cute holder is a must have! I went with a half size Mini Treat Bag and some die cuts, no stamping on this one! The banner came from the Mini Treat Bag set of thinlits. I added in “spooky” from the Seasonal Frames Thinlits and “Boo” from the Boo to You Framelits. Next treat is a cute mini Berry Basket like the one Erica Cerwin made. I loved the idea of the smaller basket, anything mini is super cute! It’s embellished with the skull and bones plus more Happy Haunting Designer Paper. And I have one last goodie, this one is actually perfect for hanging the banner on your fridge or other magnetic service. These little guys are one of my favorite little 3D items. Clothespin magnets are fun to embellish and easy to make! For this pair, I just covered the the clothespin with Happy Haunting Washi tape and added magnets to the back. The Boo to You framelits made the stamped images quick to die cut and add to the front with dimensionals. One thing I did forget to mention is the awesome spider web doilies that are scattered through the projects and pictures. These babies are so cool! I added them as embellishments on my treats plus used them as actual doilies on my tablescape. Definitely a must have item for Halloween! I hope you are leaving today inspired to create! Paper crafting for the holidays is such a rewarding experience! Do you do paper crafting for the holidays? What is your favorite type of crafting? If you need inspiration, there are lots of ideas here on my blog for Halloween and fall right now and I have lots more to come for Christmas! Would you like to learn how to make an easy accent that packs a big punch? Well, look no further! I have a video tutorial to show you how to create bold flowers that give your cards and gifts the WOW factor you are looking for. Last week I shared this fun mini treat bag with you that included a flower made with the new COTTON PAPER. I love how easy this flower is to make, it comes together in minutes! Here’s an alternate idea using different colors and framelits. I love the bold stripes with these bright colors! Let’s get to the nitty gritty with some products that you’ll need and measurements. I have all of the products I used listed below, you can click on them to find more information. Watermelon Wonder Flower: Uses (1) sheet of cotton paper. Cut (2) strips 3 1/2″ x 12″ and cut those two strips down into (6) 3 1/2″ x 3 1/2″ squares. Die cut with third floral framelit from the center. Cut (2) Strips 2 1/2″ x 12″ and cut down into a total of (8) 2 1/2″ x 2 1/2″ squares. Die cut with the second floral framelit from the center. Bermuda Bay and Crushed Curry Flower: Cut (2) Strips of Bermuda Bay 3 1/4″ x 12″ and cut down into (6) 3 1/4″ x 3 1/4″ squares. Die cut with largest flower from the Flower Fair Framelits. Cut (2) strips of Crushed Curry 2 1/4″ x 12″ and cut down into (8) 2 1/4″ x 2 1/4″ squares. Die cut with the five petal flower from the Flower Fair Framelits. I hope you enjoyed today’s quick video! Now go and give these gorgeous flowers a try! With all the rainy weather lately in Ohio, I needed a bit of a pick-me-up! 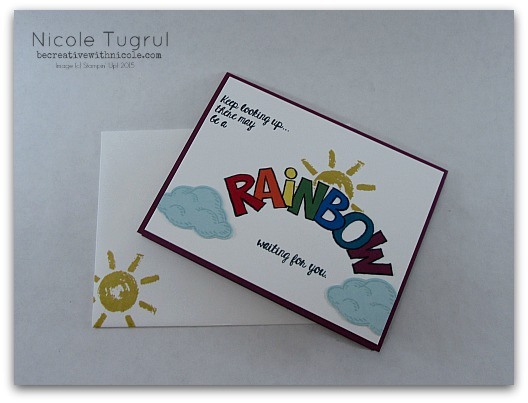 To the rescue was the FUN new stamp set OVER THE RAINBOW. This is one of those whimsical sets that you just can’t help but smile about! What inspired this happy design for today?? None other than the unique sketch at Try Stampin’ -Or Not- On Tuesday. Isn’t this a fun way to inspire creativity! You can pick the photo or the sketch…or both! I don’t have anything beachy, so I used the sketch to bring my happy rainbow to life. As you can see, I did some serious paper piecing! It took a bit of fussy cutting, but it was totally worth it! 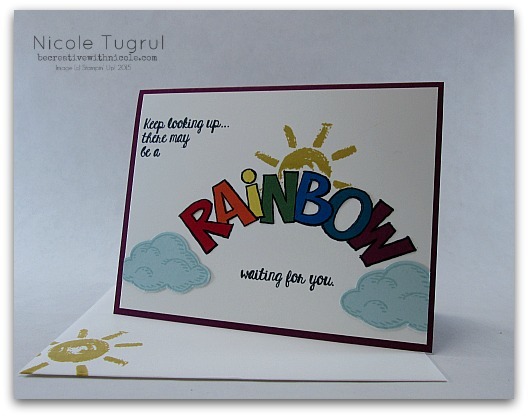 Clouds from Sprinkles of Life were a nice compliment and fit just right with a rainbow. They were an easy addition, the coordinating punch meant no more fussy cutting for this card! Alright, now it’s up to you to turn a little inspiration into a gorgeous card. Why not give this week’s sketch a try with me?? Just hop on over to Try Stampin’ to get all the details and see more great samples from the Design Team. Thanks for hanging out with me today and Happy Stamping! Welcome to another Create with Connie and Mary Saturday Bog Hop!! All during June we are featuring different FUN FOLD CARDS and this week is the SINGLE STAIR STEP CARD! 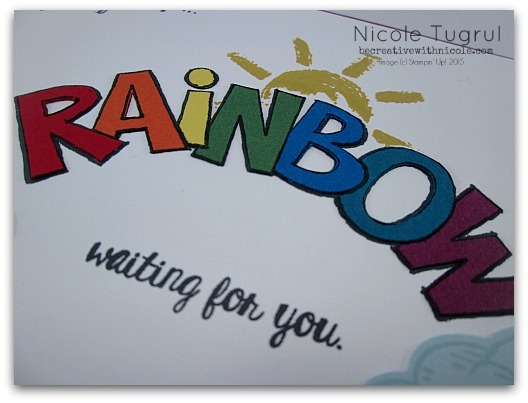 You should be arriving from Mary Brown’s amazing blog Stamper Camper’s Corner, wasn’t her card fabulous!! If you are just starting out here, welcome and enjoy the ride! Be sure to stop at each blog to check out all of the cool cards we have for you today. Today’s FUN FOLD card is new style for me and I have to say I LOVE IT! It was so much easier than I thought and has a great WOW factor since it stands beautifully. As I thought about what to do with the card, I first focused on how to embellish the outer panels. I looked through my new stamps and the vine in from the Hostess set Floral Wings jumped out at me. Perfect fit for the slender 1″ panels! From there the rest just came together like magic! You need a gorgeous butterfly to go with the floral vines, so I looked to the AWESOME new WATERCOLOR WINGS for my focal point. 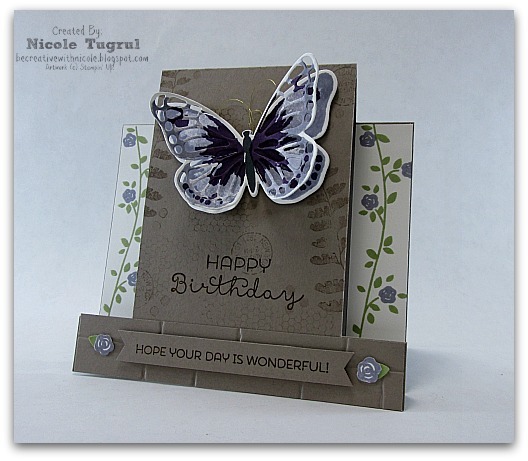 This butterfly is way too much fun to stamp and can be highly addictive…..just warning you now! Once you get this stamp set (and you MUST!) you will become obsessed with stamping multitudes of colorful butterflies. 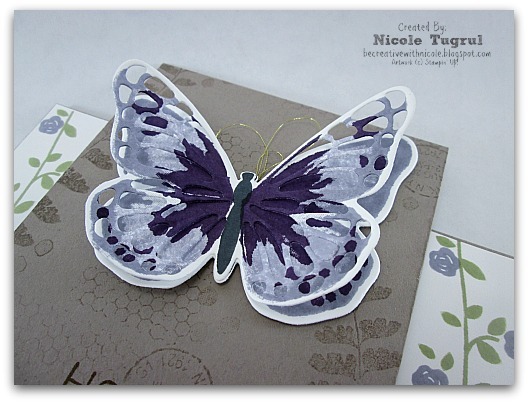 This particular butterfly was stamped with Wisteria Wonder and Elegant Eggplant. The key is to stamp off once for the first layer so it’s lighter. I will put together more color combos to share later, there are so many possibilities! I will also share how to make the butterfly 3D, I’m thinking a video may be in order….let me know if you’d like to see more! I needed a birthday card so I went with Cottage Greetings. 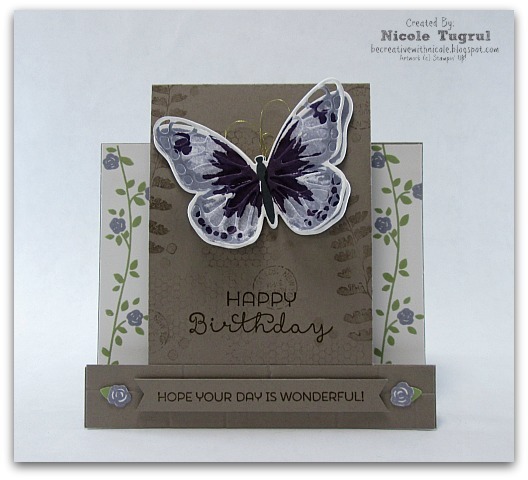 I love the sentiments, they coordinate beautifully with the butterfly and worked out great for this card! I hope you are ready to see more gorgeous cards! Let’s head over to Debbie Henderson’s gorgeous blog Debbie’s Design’s to see her amazing card for today. Don’t forget to continue through all of the blogs, you won’t want to miss a thing! Thanks for hanging out with us again! See you next time! How about something new today? I hope you have been enjoying the fun Sprinkles of Life cards, but let’s take a look at another great new set. Today I am featuring Gift from the Garden along with some other new goodies. You know what?? Everything on this card is NEW! The stamps, the embossing, the designer paper….all of it! But before we go any further, let’s talk about inspiration. For this card I looked to the sketch challenge from Create with Connie and Mary to help me put all these great new products together. My initial thought started with the two panels on the sketch, perfect for designer paper. So, I went to my stash and pulled the GORGEOUS new paper ENGLISH GARDEN. I picked a couple of designs then the colors to work with. I focused on Tip Top Taupe, Blushing Bride and Pear Pizzaz. I just have to say that these three colors are FABULOUS together!! I added texture with the super cool Brick Wall embossing folder. 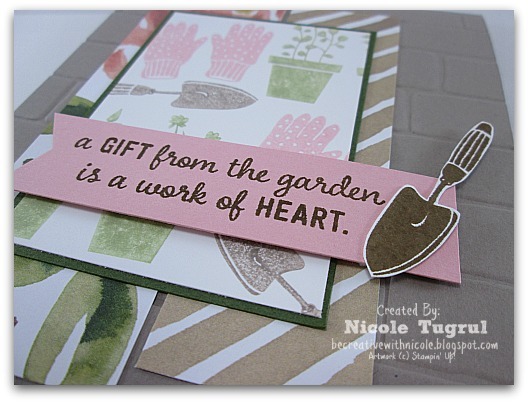 This was so perfect for a garden stamp set!! I know we’ll be seeing lots of this folder in the future, so fun to work with and a serious must have! I wanted a collage look for the large focal panel, but I didn’t want it overwhelming. So I kept it light by stamping off once to make a muted look. Now for the sentiment, I wanted it to be bolder and stand out. So, I went with Soft Suede and it worked perfectly. I also have a little TIP for you today. When it comes to cutting out SMALL stamped images, I find that they bend as I cut them which is a real bummer. BUT I have a solution! The new Thick Whisper White cardstock is AMAZING! I stamped my shovel and cut it out easily, no bending and no wrinkling! This cardstock should be in everyone’s craft room, so many ways to use it! Last but not least, I added the cute polka dot boots to the envelope to tie it all together. So, that’s it for me today! I’ll be back with more inspiration from the new catalog. I’ve been playing with the super gorgeous Watercolor Wings and have lots to share with you!